It was Ken Saydak who was most responsible for the making of Back to Chicago . It was his concept to bring these players together in his native Chicago for a bit of a reunion. Ken has enjoyed a more than 40-year career as a musician, writer, vocalist and producer. He currently hosts a two-hour blues radio program. The Trinidaddio Blues Hours at KCRT-FM, a commercial station near his home in southern Colorado. Ken is the pianist, organist and accordionist on over sixty albums. His first two solo efforts are on Delmark. 1999's Foolish Man (Delmark 725) and 2001's Love Without Trust (Delmark 751). Prior to that Ken was one of the founding members of the band Big Shoulders and was sideman to countless hard-core Chicago blues artists mostly notable Johnny Winter (he recorded with on four albums with Johnny), Lonnie Brooks and Mighty Joe Young. Ken recorded as sideman for Delmark artists Lurrie Bell, Karen Carroll, Dave Specter, Tad Robinson, Zora Young, Jesse Fortune, Johnny B. Moore, Bonnie Lee, James Wheeler, Willie Kent and others. Young kid goes to a blues concert, falls in love with the music, meets the artist who invites them to visit them in Chicago, said kid decides to leave home town to move to Chicago to be a blues musician. It's not an unusual story. 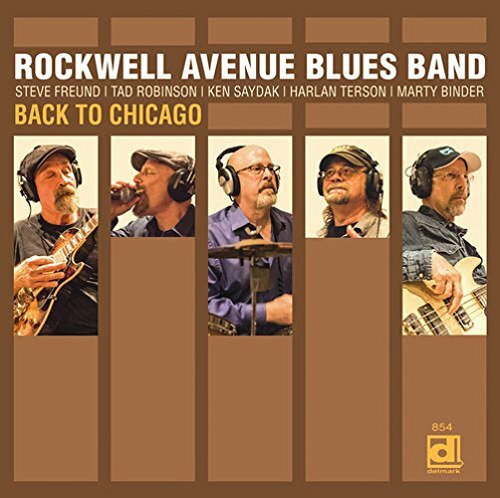 It's happened to at least a couple dozen active musicians on Chicago's blues scene and that's exactly how Steve Freund came to leave New York in June, 1976 and land in Chicago. It was Sunnyland Slim who made the invite and Steve ended up in Sunnyland's band for 18 years! Guitarist, producer and bandleader Steve Freund was praised by Rolling Stone magazine for his "masterful, no-nonsense guitar work". Steve won a Grammy for his appearance on Koko Taylor's Blues Explosion album. Steve's Delmark albums include "C" For Chicago (Delmark 734), I'll Be Your Mule (Delmark 752) and a co-led album with Dave Specter, Is What It Is (Delmark 672). Steve re-located to the San Francisco bay area in the 1990's and continues to be active on the blues scene there. Harlan Terson - The Blues Person, as he's fondly called around town, is a Chicago native who also became active on the Chicago blues scene in the 70's. He started in the Lonnie Brooks Band and worked with Ken Saydak who later joined. Harlan has worked with Otis Rush, Jimmy Rogers, John Littlejohn and countless blues legends and is on dozens of Delmark albums including releases by Saydak, Freund and Robinson. Marty Binder went to see Junior Wells and Buddy Guy in 1980 at the Checkerboard Lounge. He even sat in on drums that night and shared his contact info. Short time later he gets a call to tour with Junior and Buddy and so at the age of 21 Marty was on the road with some real blues giants. He ended up working with Junior through the 1980's and moved to the Buddy Guy band in 1990. With Buddy he performed on The Tonight Show and played with Eric Clapton. He moved on to work with Albert Collins, Coco Montoya and Deborah Coleman before hooking up with Rockwell Avenue Blues Band. All these musicians have worked together in so many different units it's impossible to take the time to list all of them. But it's wonderful that they took the time to reunite to create this exciting album that brings it all back home. This CD is available directly from Steve via mail for $20 shipped to your door via mail. Please contact Steve directly via e-mail for details.